As Team Japan began its quest for a third consecutive World Baseball Classic championship, fans in the country tuned in at levels matched only by the world’s biggest sporting events. 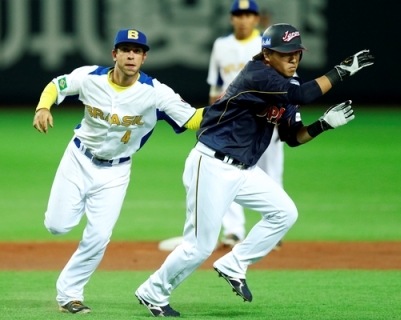 One-third of all televisions on in Japan were tuned to the World Baseball Classic for its three first round games from Fukuoka, topping all broadcasts of the 2012 Summer Olympics competition as well as all other non World Cup sporting events in Japan over the past year. The peak viewership for TV Asahi in Japan came during the team’s 5-3 victory over Brazil to begin Pool A play on Saturday, March 2, which drew a 35 share (percentage of viewers whose television was on). Japan’s next game against China the following day, which Japan won 5-2, drew a 30 share, as did the final game of Pool A between Japan and Cuba once both had already qualified for the second round. Japan continued its run today with a thrilling 10-inning, 4-3 comeback win over Chinese Taipei to start the Second Round. In other Second Round action from the Tokyo Dome, the Kingdom of the Netherlands defeated Cuba 6-2. All games will be shown on MLB Network and ESPN Deportes in the United States. Tickets are on sale now and can be purchased online at www.worldbaseballclassic.com.